Stunning Audrey Hepburn Replica set is from the movie 'Roman Holiday'. This beautiful tiara features crystal flowers and leafs with a brilliant silver finish. 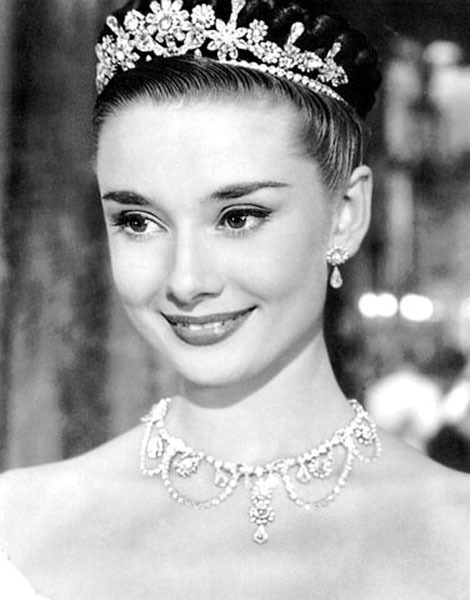 The tiara, necklace, and earrings are made of Swarovski Crystals and Austrian rhinestones. This set consists of the AH1 Replica Tiara and the AHN1 Necklace set. To see the originals worn by Audrey Hepburn ,please click here. Necklace length: 17" - 19"